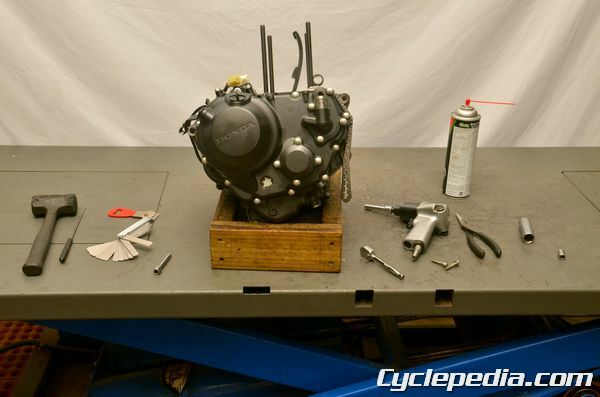 Pictured above: Cyclepedia Honda CBR250 Manual in progress. Working on Honda’s CBR250R, entry-level sportbike, has been pure joy. So much care and attention to detail has gone into the design of this vehicle and the serviceability of the bike. A well placed oxygen sensor is conveniently located in the cylinder head so it can be unplugged rather than unscrewed like the old style sensors. This small nuance, which is one of many, allows for easier removal and installation of the exhaust. The Honda CBR250R also has a modern easy to service starter motor like the larger CBR’s. The top end of the engine has a nice blend of performance and reliability so it’s fun to ride but not going to wear as fast as a race engine, this has been a quality lacking in this class of bike for some time. Today we’ve torn into the bottom end of the engine and of course we’re taking as many photos as needed as we go. Be sure to stay tuned as our Honda CBR250 online manual takes shape. If you plan on doing repair and maintenance to the CBR250R then you will want the Cyclepedia manual and tech support behind you!